Color is the life of art. And the right medium can really make colors pop off the page; colored pencils being a beloved medium for traditional work. But there are so many different packs and they vary so much between styles. How do you know what colored pencil set to choose? How do you pick between student, professional, and artist grades? Which types of leads blend the best? In this article I’ll examine all of these features and a whole lot more to help you pick the very best colored pencils for your needs. Whether you’re looking to color an adult coloring book or draw your own work from scratch, there is a perfect colored pencil set with your name on it. 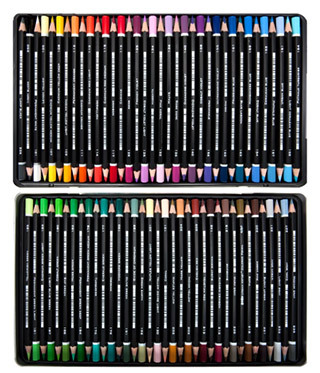 This artist grade set uses thick, soft cores that are almost pure pigment to leave silky and opaque lines. Blending, shading, and combining colors feels effortless with the Prismacolor Premier set. The thick lead stays sharper longer, resists flaking, and gives a wear-resistant and waterproof finish to keep your artwork in-tact for years. Choosing the right colored pencil set isn’t as easy as going to the store and picking up the first box you come across. While you can go this route, you will probably end up disappointed with the result. So what do you need to consider when selecting a set? Your budget is going to play a big factor in the selection process. 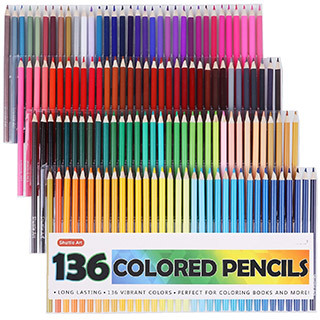 Colored pencils range in price from a couple of dollars to over a hundred. Yes, really! Quality, number of pencils, and what comes in the set will affect the overall cost. However you can be frugal and still walk away with a great pencil set. Just like being a carpenter or a repairman, artists need the right tools for the job. What is that job, though? Most smaller sets are marketed to adults for coloring in books. If that’s what you’re looking for then virtually any set will work. If you are creating your own drawings you may need more specialized sets. There are several grades of colored pencils; however, the three most common are Student(or Scholar), Professional, and Artist. It can get confusing since not all sets are labeled with their grade, and some companies use the professional and artist grades interchangeably. Depending on your needs, knowing what grade and how the pencils are made will go a long way towards finding the perfect set. These pencils are a step up from the basic colored pencils. Their cores(which I call lead, even though they aren’t made of lead anymore) are hard, brittle and dull quickly. Student grade pencils tend to color well but leave behind the tell-tale signs of pencil marks and scratches. Student grade pencils are designed for colors other than pencil gray, but just barely. They offer more composite material and less pigment. The colors are brighter than the pencils from 3rd grade art class but aren’t super vivid. You won’t often find student grade pencils that are waterproof or wear-resistant. However they will save you a lot of money. Student grade pencils tend to cost 50 to 60 percent less than the higher grade ones. Though they don’t last as long so you may end up paying more in the long run. With professional grade pencils you can have either soft or hard cores. And depending on the other factors they will be better used for blending, shading, or filling in. The cores are medium to thick depending on the brand and are less likely to flake or need constant sharpening. You will also find that you pay more for the professional grade than you will for student grade sets. Though if you go professional you will know where your money went. The colors are vibrant and most will be wear-resistant. If you search enough you can find a set that is also waterproof. So artist grade pencils are going to be the most expensive when it comes to initial costs. However you will notice that these pencils last a lot longer than any other grade. In the long run this offsets the cost and the longer you use them to draw or create, the less they will end up costing you. Artist grade pencils tend to have thick, soft leads and contain more pigment than any other grade. Usually these will be oil based cores instead of wax-based like the student and some professional grades. Because of this, the colors will glide smoothly on the paper without a lot of skipping, jumping or blanking. Absolutely perfect for professional artists or anyone practicing to become an artist with serious effort. The cores of colored pencils are colored with pigments that are either wax based or oil based. Either will work, again depending on what your primary use is. Oil-based cores tend to be harder, more rigid, and are prone to flaking and breaking. This means you will stop more often to sharpen the pencils. Wax-based cores, on the other hand, are soft. While drawing they almost seem to melt right into the paper. This makes drawing a little more difficult but once you get used to it you won’t want to go back to oil. The oil-based colors hold more pigment (in general) than their wax-based counterparts. This translates into more vibrant colors and the ability to blend and mix a lot easier. You can also do shading work but it is more difficult with oil leads than with wax. Grade, price, and core materials are going to be the largest factors in deciding on which set to purchase. However there are some smaller details that some people like to have (or avoid). For instance, some sets will have well over 100 colors to choose from but not all of them will have the color name on the pencil itself. Some artists like the ability to search for “Copenhagen Blue” while others just look at the sharpened tips to find which one they want. Pencil length is also something to consider. Shorter pencils will wear down faster and be more difficult to hold towards the end of their life. Longer pencils, though, can be more difficult to manipulate in tighter coloring areas for detail work or shading. Lead thickness, durability, and width all come into play as well. Thinner pencils will have less lead and cause more hand fatigue as they are harder to hold properly. 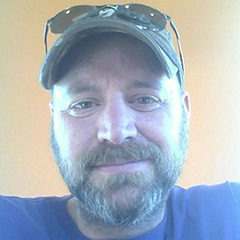 You will have to try out a few different styles to find out which length and thickness work best for you. But generally speaking all sizes of colored pencils should work for all purposes. It’s mostly about getting used to the feeling. Now that you know what to look for let’s browse through the best colored pencil sets out there. I have a feeling your next set will be somewhere on this page. 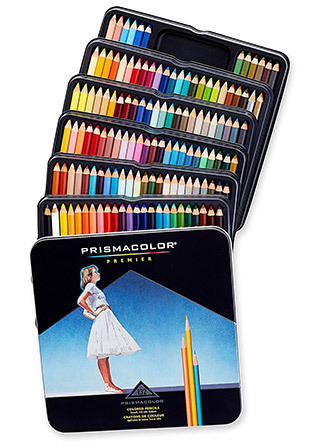 The Prismacolor Premier set includes 132 shades of colored pencils that offer superior strokes and lines. The wax-based soft cores leaves behind vibrant colors ideal for blending and shading. These artistic grade pencils are slow to dull and don’t skip or scratch the page. Perfect for any pencil sharpener so you won’t worry about too much breakage. Silky lines let you create solid blocks or hinted shades along tight edges. You can even color over other pigments without bleeding to create even more shades. You also get the color names in both English and French as well as the pencil number printed right on the barrel. Really a top-notch pencil with a high-quality build. If you are creating your own projects or need a versatile tool for coloring, the Prismacolor Premier pencils will give you the best of both worlds. 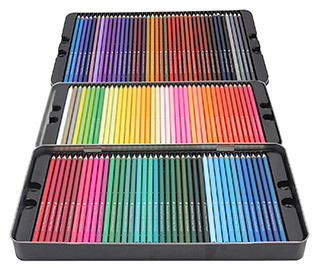 These also come in smaller sets if you need less than 100+ colored pencils. So there’s really something in the Prismacolor lineup for everyone. 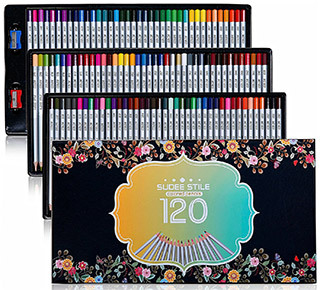 SUDEE STILE has a professional grade colored pencil set with 120 unique colors. The wax-based cores are soft yet firm to give the user a solid marking pencil. SUDEE STILE has enlarged the cores and uses poplar wood for the barrel which gives a firmer grip with less hand fatigue. The wood and core combination make the pencils easier to sharpen and hold the lead in place to prevent breakage at the tips. Much moreso than other hard cored pencils. The pencils will dull faster than the oil based cores; however shading lines can be achieved with better results. Colors are numbered but not named on the barrels. The actual color numbers are stamped on the wooden barrel and the blunt ends have a color cap displaying the lead color for easy identification. This all feels very intuitive when working and drawing regularly. The set includes three removable trays with two sharpeners to ensure you always have the proper tip for your projects. The oil-based cores of this Arteza set make for bright, vibrant coloring experience with minimal breaking. These pencils are encased in a hardwood barrel and do not flake, break, or splinter when sharpening. You can use almost any pencil sharpener and never sweat extra breakage from too much force. The set of 72 colors focuses more on the darker tones, which is bad news for those that work on darker paper. But if you usually work on lighter paper or in a sketchbook then you won’t miss those brighter toned colors. 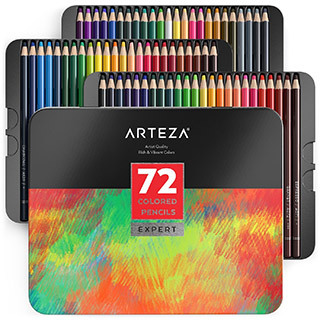 You can’t replace individual pencils as the Arteza pencils are only sold in sets. But you can get a cost-effective color range with their different sets. This is good if you tend to use up certain colors well before others. Not only are the barrels marked with the pencil number and colors but you will also notice little plus sign markings(up to three) on each pencil. This is the lightfast rating. One plus has a lighfastness of 10 to 25 years, two pluses rate at 25 to 100 years and three pluses rate over 100 years. Pretty cool feature! 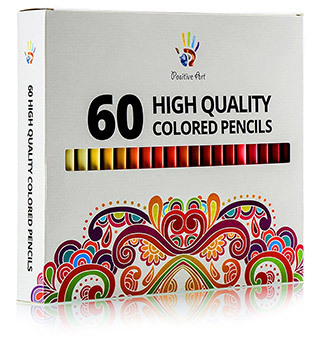 Positive Art has a professional grade set of 60 colors that have an incredible feeling in your hands. The thicker barrel is soft to grip and doesn’t slide as much as some others in this list with a similar build. The cores are hard which can break at the sharpened tips with too much pressure. So you have to be cautious of how much you’re pushing on the paper. Once you adjust your hand to the new feel these pencils glide along smoothly. They aren’t as bright as some of the higher-end artistic sets here. But for general coloring you won’t notice much of a difference honestly. The cores are thick and provide broad coverage with minimal effort and with less hand fatigue you can color for longer. This is good news if you find yourself pushing too hard on your current pencils. These colors are mixed well and don’t fade in light, though they aren’t wear-resistant or waterproof. I’d say this pack is great for newer artists who have never used colored pencils before. Break into the game with a set that feels professional but doesn’t come at the same price tag. Shuttle Art has a fantastic soft core colored pencil set designed for students and professionals alike. Normally there isn’t a hybrid between student grade and professional grade, but Shuttle Art found a way. The cores are wax based to provide an even glide, though the barrel wood is a little less than professional quality. You probably won’t notice this as you get used to working with them. For coloring books and general coloring on printer paper, these pencils work great. Sharpening can be frustrating as the barrel splinters and the lead can crack. I’d recommend a simple handheld artist sharpener if you go with this pencil set. But in the set you get a ton of variety. This includes 136 colors that lay down a smooth, easily blended line that’s ideal for mixing and shading. A very nice pack considering everything you get, just have to play with them cautiously. 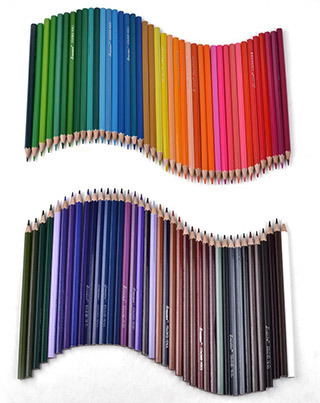 Coloré has their own student grade colored pencil set designed for everyday use by anyone. The barrels are designed for easy grip and firm control. This goes for kids and adults. However they are prone to splintering when sharpening so I definitely suggest a handheld sharpener for this pack too. The cores are harder than most others so don’t be confused by the label on the packaging that says “Artistic Quality.” The set is not artistic grade. But that marketing faux pas aside, the colors are rich and lay down easily on any paper. The number identifier is printed on the barrel but not the color name. Although the lead color is reproduced on the barrel end which is a very close match to the actual color. The cores resist breaking mostly because of how dense they are. If you’re coloring with lines you’ll notice they feel lower quality than that of the higher-end pencils. But for standard drawing hatch shading they work very well. Especially if you’re getting a pack for your child or if you’re just starting out with colored pencils. 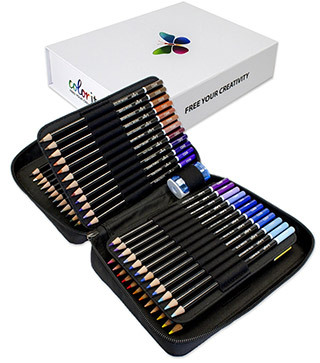 These ColorIt colored pencils are a professional grade pencil set that come in a zippered travel pouch for easy transportation. In this set you’ll also get a bonus sharpener so you don’t need to purchase one separately. This is great news for anyone who’s never worked with colored pencils before. All cores are wax-based for a softer, smoother effect. No extra pressure required. The softer cores don’t flake as much when being sharpened and they hold a point longer. Plus with these softer cores you’ll find they hold more pigment than some of the other options on this list too. Your finished result is a vibrant colored piece that mixes well with all colors on the page. And the thickness of the marks lend to blending and smudging. Wear-resistant, though not waterproof, you can still use oils to mix and blend on paper if needed. Also worth noting these barrels have the color marked on the end of the pencil and the color name and identification number are printed about halfway down. 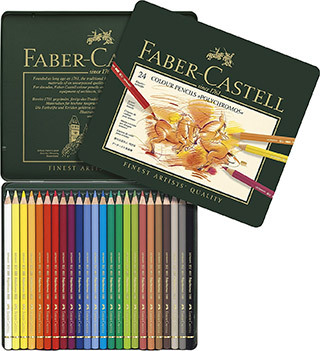 For over 250 years, Faber-Castell has been producing high-quality art sets and materials to artists of all ages. 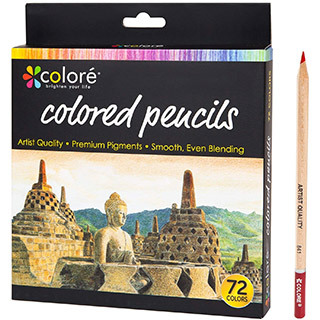 These colored pencils are professional grade with extra thick lead(3.8mm versus 3.3mm). Because of this thickness the leads resist breaking and chipping, even when being sharpened aggressively in an electric sharpener. The oil-based cores lay down a smooth and rigid color that mixes better than most other oil-based pencils. The barrel’s wood is the color of the pigment for the entire length of the pencil, not just the blunt end. The names of the colors, though, are not printed anywhere on the pencils. On the plus side all of these colors are wear-resistant, water-resistant, and have a lightfastness of over 100 years. The smooth softwood surrounding the core is easy to hold and offers very little hand fatigue. You can draw for hours and get some real high-quality output! Diamond Driven colored pencils are student grade pencils that offer a professional grade final work. The cores are standard thickness and oil based, which means you can sharpen them to a fine point without worrying about breaking. I often worry about sharpening my pencils and this pack really felt incredibly sturdy. I’d rank it within the top 3 of sturdiness when used inside an electric sharpener. The barrels show the color of the pigment, but unlike most professional/artist grade pencils they are not SV bonded. Because of this you may experience some lead and barrel separation which can lead to the barrel splintering during sharpening. Or even during repeated use. The colors do blend well and with the harder core you can do detailed work in smaller areas, perfect for coloring books and more complex drawings. 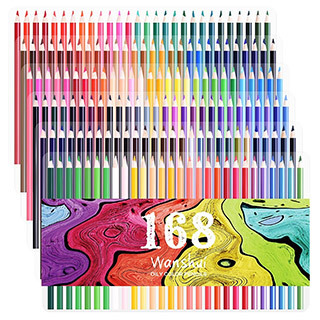 Check out this 168-set of Wanshui colored pencils. It gives you some vibrant colors totaling 168 student grade pencils that include neon and metallic colors. If you prefer to color to draw on darker toned paper this set will show nicely. With soft leads you’ll be able to lay down color with the best of the oil-based cores. Very little pressure needed so you can even use this on thinner tracing paper. Blending leaves a bit to be desired with these pencils, due in part to the hardness of the leads. These barrels are bonded so splintering while sharpening is minimized quite a bit, though not eliminated. The hard cores are also prone to flaking when using too much pressure so keep an eye on your posture. Remember these lay down smooth and you do not need to push very hard. The packaging is eco-friendly which is a huge plus. But not very transportation friendly. Once you remove the cardboard band you are left with four PET plastic trays and nothing else. So you may need an art supplies container to keep them all together. The pencils themselves are not named by color, but instead by number. Wanshui has included a DIY list where you can color in a box and label the colors next to each number for easier reference. It’s a cool feature but can be a tad annoying. Would be nice if they were labeled, but that’s such a small complaint that it really doesn’t detract from quality. If you are looking for style and comfort then the SoHo Urban Artist set is for you. These black lacquered barrels are hexagonally shaped for an extra easy grip that’ll keep you drawing for hours. The barrels are mostly black with the ends showing the core color. Now the cores themselves are wax-based and extra thick(3.8mm) which have been glue bonded to the barrel. Resistant to breaking, chipping, or smudging, these colors get onto the page smoothly and evenly. I will say the pencils are a little shorter than you may be used to. But with consistent use you will find the tips don’t dull fast and you can have more control over the pencil. Really this is a pack that grows on you over time. It works great for both newbie artists and more professional artists alike. If you need a high-quality colored pencil set but are limited on a budget then check out this CYPER TOP set. With a total of 80 different colors you’re walking away with one hell of a bargain! If you purchase the cylinder of pencils you will get the 80 pencils in a cardboard rounded container without any add-ons. You can also purchase the case which gives a more permanent home to these pencils and includes a sharpener with three small rolls of decorative duct tape. Extras aside, the pencils draw really well. You can’t expect a lot in the way of top quality but you can expect these to draw well and leave behind some gorgeous colors. The pencil barrels are hardwood to resist breaking while being transported. And the leads offer a smooth, student grade color set which is great considering everything you get here. It’s noticeable that the pigment isn’t as rich as most other pencils that cost a lot more. That’s really a given. But for coloring books, basic practice, or testing new ideas, the price tag far outweighs the complaints. The three most important factors of any colored pencil set are the lead type(oil or wax-based), quality grade(student, professional or artist) and your budget. Another thing to consider is your skill level and what sort of quality you’re looking for. 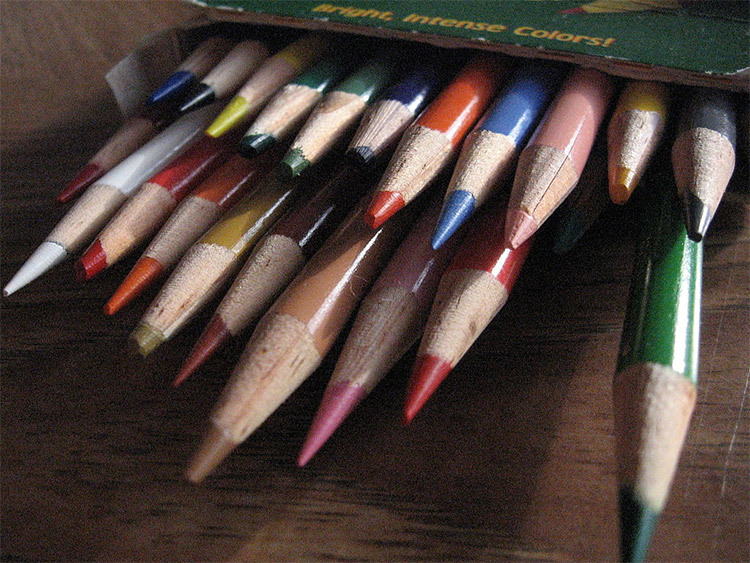 Even professional artists will pick up a smaller pair of colored pencils every so often. It’s crucial to know what you’re looking for and get a set based on your specific needs. Looking over all the options I say the Prismacolor Premier set has everything that any artist would need. This set offers vibrant colors, durability, and continuous performance with a trusted brand name. However you may decide you like a longer barrel, a thicker core, or just don’t need that many colors. So if the Prismacolor pack isn’t for you have another look over this list and see what you think. You’re sure to find a great set of colored pencils if you keep researching and know exactly what you’re using them for.